Friday’s fancy lineup includes fun for all ages – We’ve got FREE Yoga at Hyattsville’s Love Yoga (register now! ), Toddler Time at Mt. 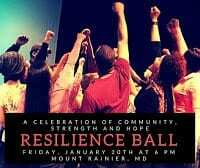 Rainier’s Art Works Now & the Resilience Ball at Joe’s Movement Emporium. Saturday’s got a Bibliobop Dance Party in Greenbelt, Dinosaur Park in Laurel, some reading help with Tail Waggin’ Tutor in Beltsville or Sip & Sew at Hyattsville’s Three Little Birds! 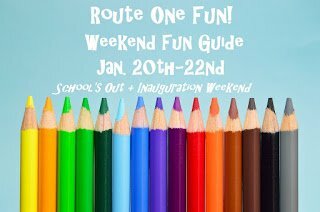 & even more fun picks for Sunday! Check it out! All-day, structured art classes offered on days when Prince George’s Public Schools are off. Young artists are invited to join us for hands-on art activities that teach skills in art materials, core principals of art, and insights into world cultures. Ages: 6-12. Must register, do so here. Open studio time for toddlers and their accompanying adults. Join us as we make pipe cleaner caterpillars! Helping to develop their fine motor skills they will string fruit loops onto pipe cleaners to make colorful caterpillars! 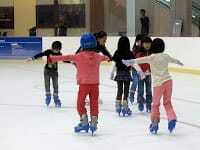 Huge indoor ice skating rink with a warming hut and a snack bar – what else do you need?! 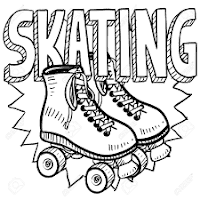 Cost: $4 (skate rental included)! 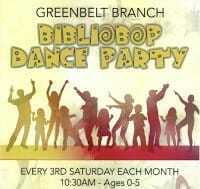 Come and bust a move and shake your sillies out at the Greenbelt Bibliobop Dance Party! Bring your parents or caregivers and prepare to boogie and bop until we all drop! Stories, Fingerplays, and songs will be presented in Spanish and English. 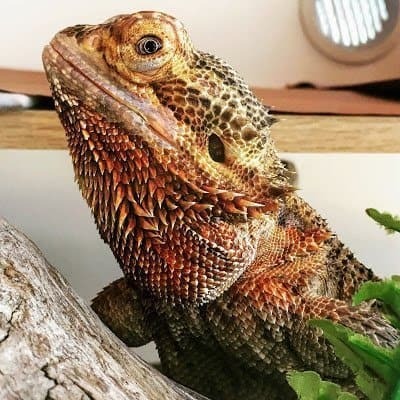 Meet the Mount Rainier Nature Center’s live animals including reptiles, amphibians, & birds of prey. Register here. Come to Dinosaur Park Open Houses (every 1st & 3rd Saturday) to meet paleontologists, learn about Maryland prehistory, and search an active fossil site for 115 million-year-old remains of dinosaurs and other prehistoric animals! When: Noon – 4:00 p.m.
Beltsville Branch’s own canine bibliophile welcomes children ages 6-12 to read to him! 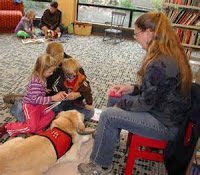 Children ages 6-11 build their reading confidence by reading aloud to specially trained therapy dogs that are glad to listen. Registration is required. Please call 301-345-5800 for details. Learn about wildlife at the refuge through fun and interactive songs and rhyming. Parental participation is required. Ages 16-42 months. Halftime Basketball Match: College Park Dream Team! The College Park Dream Team showcases relationships between community youth and local law enforcement through food, fun, and friendly basketball games. Come see the participants in action during halftime as your #3 ranked Maryland Women’s Basketball team faces off against Rutgers in a nationally televised game! Love Yoga – Free Classes Today! Need a safe & loving place to come on Inauguration Day? 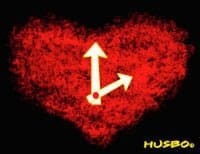 We’re holding classes all morning and the evening so you can practice and surround yourself with love. All classes are FREE (donations welcome)! Join us, and be sure to preregister. We expect classes to fill up! American Legion Post 60 Bingo! Teleworking today & need a coffee? Head to Vigilante for a cup and stick around for their weekly coffee cuppings – a great way to learn more about coffee, broaden your understanding of origins, flavors, aromas, enhance your palate, and try a wide variety of coffees in one sitting. The novice to experienced writers are welcome to find your creative voice through writing. Writers share ideas, find inspiration, and participate in the group critiques. All writing genres. Join us for an afternoon of crocheting! If possible, please bring your own materials due to limited supplies. No experience necessary. All ages. Drawn Out, Drawn Over aims to field a visual conversation about drawing approaches by featuring 18 selected artists living throughout the United States, most of who have had devoted careers as academics. Their institutions range from small liberal arts colleges, community colleges, and some of the largest research institutions in the country. Once a month, we host this fun get together where we make a small project and enjoy a glass (or two) of wine! All supplies and refreshments are included. All skill levels are welcome to attend. Exhibition is composed of 50 large scale photographs by Smithsonian photographer Carolyn J. Russo and explores the forms and functions of the airport traffic control towers in the US and abroad. Through March 10th. Join us in making a fun & stylish poncho, perfect for the cooling weather. Perfect for advanced beginners and intermediate sewers and those looking to take an intro into garment sewing.